The Hercules Tires Destination Recreation Sweepstakes is open to legal residents of the United States and the District of Columbia, who are 21 years of age or older. 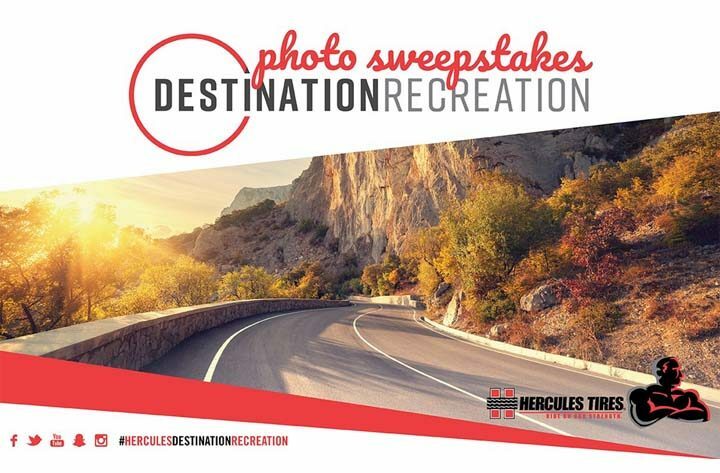 The Hercules Tires Destination Recreation Sweepstakes ends on July 16 at 11:59:59 PM EDT. To enter, go to herculestire.com/sweepstakes to complete all required fields in the entry form. Limit one (1) entry per person/email address. Approximate retail value (“ARV”): $2,250. A set of four (4) Hercules Tires and a $100 prepaid debit card for tire mounting and balancing. ARV: $750 each. One (1) Hercules Tires branded backpack. ARV: $50 each.